Enjoy quality visuals and amazing connectivity with the Samsung DB55E Digital Signage. It is the perfect display for large-scale advertisement and imagery required to capture consumer's attention. Powered by Cortex-A9 Quad-Core processor with a speed of 1GHz and Linux Operating System which delivers a powerful, all-in-one signage solution. 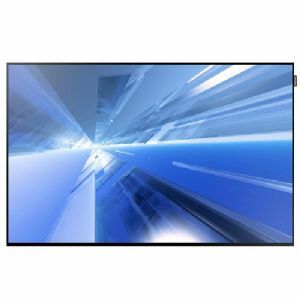 Offering you a 55" class display which produces FHD quality images in a resolution of 1920x1080 for amazing clarity and details. It comes with a contrast ratio of 5000:1 which ensures that you get to view every detail along with the darkest and brightest colors. Ensures blur free motion images while watching HD videos with its 8ms response time. In addition, it is equipped with one HDMI, one DVI-D, one VGA and one USB 2.0 which expands your connection to various sources, allowing you to explore more of your monitor's capabilities. With rj-45 port, you can connect this to a network. Featuring a built-in Tuner which allows you to control the monitor without setting up a power unit with it. With D-LED BLU technology, it deliver rich picture quality, low power consumption and reduced operating costs. Simplified content management with integrated WiFi and an application easy to use mobile. So, what are you waiting for? Purchase the Samsung DB55E Digital Signage now!